A luxury four-star spa hotel located deep in the heart of the beautiful New Forest National Park. 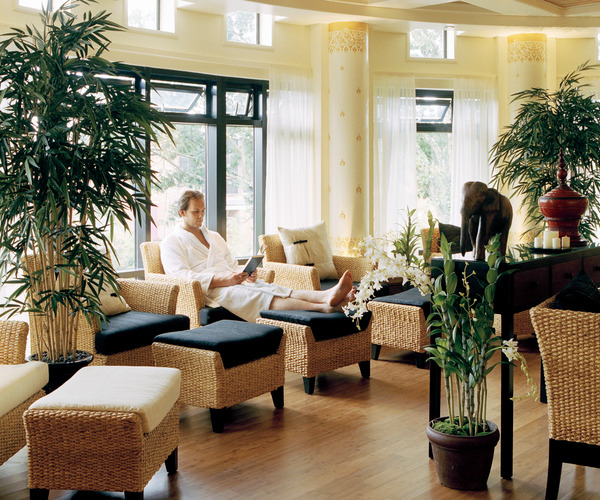 SenSpa at Careys Manor Hotel is a temple to tranquillity set in the heart of The New Forest, England. Experience the magic of water and its therapeutic benefits at this award winning Thai Spa. State of the art facilities include a large hydrotherapy pool, ozone pool, herbal sauna, amethyst crystal steam room, laconicum, tepidarium, ice room, experience showers, rhassoul mud and hammam rooms. The luxury spa boasts 17 treatment rooms where you can indulge and be pampered with the finest treatments from hydrating facials to authentic Thai massages and mineral-rich body wraps. All treatments use chemical-free, organic products, and the body oils used are from SenSpa's own Soil Association accredited Organic Therapy Range. Take a revitalising swim in the 14m UV treatment swimming pool overlooking the tranquil Zen Garden, then enjoy lunch at the serene Zen Garden Restaurant, offering fresh smoothies, champagne, a light lunch or three course meal. Maximum of £500.00 per visit can be redeemed.Can only be redeemed against spa-related products, day spa packages and overnight spa packages. Hotel will have the right to decline a voucher payment for other items (food & beverage, accommodation). Vouchers can’t be used on spa services provided on Saturdays or Sundays and overnight stays on Fridays and Saturdays. Vouchers can’t be used on Bank Holiday Weekends, Valentines and any other dates when Premium Pricing applies (as advised by the hotel). Booker must notify at the time of reservation about any vouchers they are planning to use. For energising workouts, pure relaxation and rejuvenation Careys Manor Hotel and Spa boasts state of the art leisure facilities and luxurious treatment rooms. All residential guests have access to the 14m ozone swimming pool, relaxing Jacuzzi, steam room, sauna, treatment rooms and gymnasium. Take a revitalising swim in the 14m ozone swimming pool overlooking the tranquil Zen Garden, great for working up an appetite before lunch, then relax on poolside reclining loungers with a good book. The well equipped air conditioned Gymnasium offers the very latest in fitness equipment for energising workouts, a variety of fitness programs and friendly well ­trained fitness instructors to help you reach your peak fitness. If you wish to improve your health and fitness our qualified assistants will assess your physical condition, guide you through remedial treatments and advice on your own fitness programme for the future. Enjoy exceptional dining in Hampshire at Careys Manor Hotel and Spa. For celebrations, banqueting, private dining and afternoon tea Careys Manor is the place to eat in Hampshire. Careys Manor Hotel is dedicated to using seasonal, free-range ingredients sourced from carefully selected local suppliers inline with our ethical food policy. Careys Manor has 77 luxurious bedroom and suites which combine utmost comfort with stylish elegance. Each room is carefully designed offering the finest combination of both modern and original features. Whether it’s the beautifully appointed and stylishly furnished modern Oakwood, Rosewood or Knightwood garden bedrooms or the wonderfully traditional Manor House rooms which include the option of sumptuous four poster beds, your bedroom at Careys Manor offers space, style and modern amenities.